Working directly with Mitch Grossbach GM of Ford Models Media and Adam Zelinka from Fanatical Marketing, Stafford managed through a highly successful clickable-video promotion for Fruit of the Loom underwear. Featuring models from Ford Models Inc., the leading management company for models and style artists globally for more than 60 years. 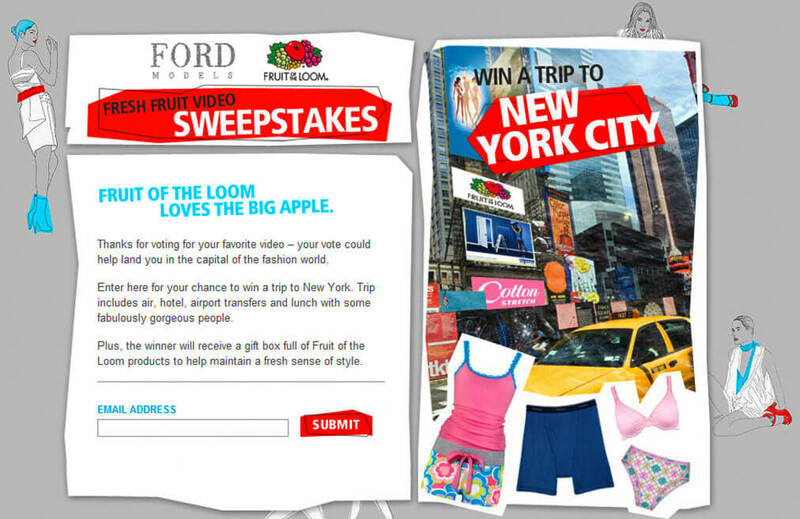 The Fruit of the Loom execution deployed the VideoClix ‘click & vote’ contest engine. Viewers were prompted to vote for their favorite video, out of five exclusively produced segments, for a chance to win an all expenses paid trip to New York City including a lunch with a Ford Model. All product names, logos, and brands are property of their respective owners. Ford Models logo is a registered trademark of Ford Models, Inc. Fruit of the Loom logo is a registered trademark of Fruit of the Loom Inc. VideoClix logo is a registered trademark of VideoClix Technologies Inc.